I have a Pinterest board that is full of decorated inspirational quotes that lead me to feel motivated and understood. There’s something deeply satisfying with feeling connected to the world around me through these particular pieces of colorful wisdom. I collected these wordy bits like a bird building its nest and would scroll over them lovingly, letting them lift my spirits for a moment. Until one day, a quote caught my attention, and as I read it again, it hung there with its arms draped around my neck like a child. It was brilliantly simple and left no room for excuses. It was the type of candid, matter-of-fact whimsical quote my mental Pinterest board had been searching for. The proof is in the pudding. I practiced being outwardly optimistic to myself, loved ones, and strangers. I became a walking, talking Pinterest board brimming with hopeful quips and unsolicited advice. Looking back, it had to have been a bit overwhelming and dare I say… obnoxious to my closest friends and family. But it WORKED. Practice really does make perfect. Or imperfect in this case. The more I consciously applied the inspirational quotes to my reactions, the more calm and serene I actually felt. I communicated the good and those words have made a difference. The Huff Post suggests that our daily thoughts will create one of two things: Separation or Intimacy. 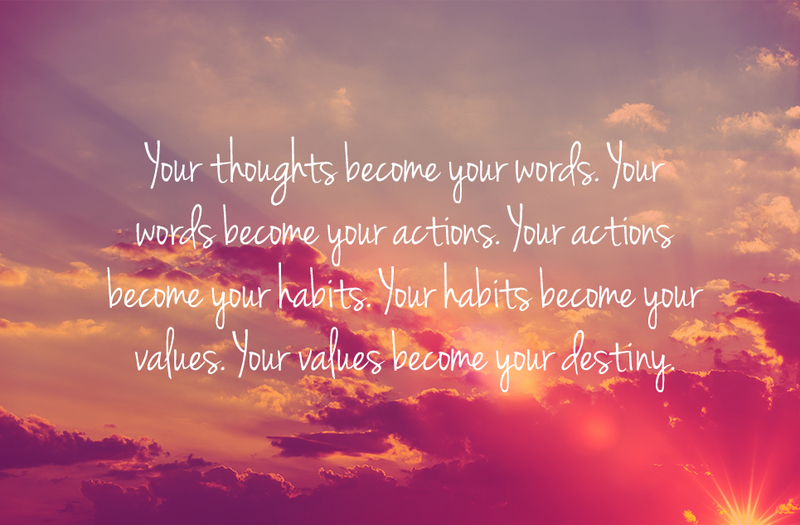 Then, of course, these thoughts trickle down to create our actions. This is the foundation of our character- it’s whether someone knows you can be depended on, or if you might flake. We articulate our destiny. I still collect pieces of colorful wisdom and open my Pinterest boards to reflect on them with gratification and I look at them through different eyes.